Our prices update every few minutes. 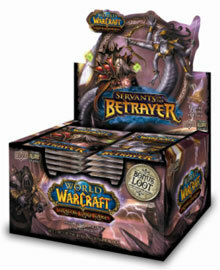 Loot cards are rare versions of the World of Warcraft trading card game (TCG) cards which also contain a scratch-off code. These loot codes are entered into the World of Warcraft promotion website to redeem unique in-game items, such as a pets, mounts, tabards, and many other items. WoW loot cards are very rare and in high demand since they supply your character with items that will make others look twice and wonder where you got it from. The best deals on these rare WoW loot cards are found on eBay. You will always find the latest and cheapest for bidding or purchase below. Releasing in April of 2008, the Servants of the Betrayer expansion is one the expansion to delve deep into the stories, minions and generals of Illidan followers Kael'thas Sunstrider and Lady Vashj and second in a series of 3 expansions dealing with The Burning Crusade. This expansion introduced a total of 264 cards into the WoW TCG and introduced Traitor Heroes and more reasons to side with Aldor or Scryer... and of course, 3 luscious TCG loot cards! The Red Bearon, being a replacement for the Amani War Bear, is the final loot card provided by the Drums of War expansion. Learn more.